Rails is an open source, model-view-controller (MVC) framework for Ruby. This tutorial walks you through the process of generating a Rails application and deploying it to an AWS Elastic Beanstalk environment. This tutorial assumes that you have some knowledge of basic Elastic Beanstalk operations and the Elastic Beanstalk console. If you haven't already, follow the instructions in Getting Started Using Elastic Beanstalk to launch your first Elastic Beanstalk environment. Rails requires Ruby 2.2.2 or newer. In this tutorial we use Ruby 2.5.1 and the corresponding Elastic Beanstalk platform version. Install Ruby by following the instructions at Setting Up your Ruby Development Environment. Use the AWS Management Console to create an Elastic Beanstalk environment. Choose the Ruby platform and accept the default settings and sample code. For Platform, choose the platform that matches the language used by your application. For Application code, choose Sample application. Review the available options. When you're satisfied with them, choose Create app. EC2 instance – An Amazon Elastic Compute Cloud (Amazon EC2) virtual machine configured to run web apps on the platform that you choose. Each platform runs a specific set of software, configuration files, and scripts to support a specific language version, framework, web container, or combination thereof. Most platforms use either Apache or nginx as a reverse proxy that sits in front of your web app, forwards requests to it, serves static assets, and generates access and error logs. Instance security group – An Amazon EC2 security group configured to allow ingress on port 80. This resource lets HTTP traffic from the load balancer reach the EC2 instance running your web app. By default, traffic isn't allowed on other ports. Load balancer – An Elastic Load Balancing load balancer configured to distribute requests to the instances running your application. A load balancer also eliminates the need to expose your instances directly to the internet. Load balancer security group – An Amazon EC2 security group configured to allow ingress on port 80. This resource lets HTTP traffic from the internet reach the load balancer. By default, traffic isn't allowed on other ports. Auto Scaling group – An Auto Scaling group configured to replace an instance if it is terminated or becomes unavailable. Amazon S3 bucket – A storage location for your source code, logs, and other artifacts that are created when you use Elastic Beanstalk. Amazon CloudWatch alarms – Two CloudWatch alarms that monitor the load on the instances in your environment and are triggered if the load is too high or too low. When an alarm is triggered, your Auto Scaling group scales up or down in response. AWS CloudFormation stack – Elastic Beanstalk uses AWS CloudFormation to launch the resources in your environment and propagate configuration changes. The resources are defined in a template that you can view in the AWS CloudFormation console. Domain name – A domain name that routes to your web app in the form subdomain.region.elasticbeanstalk.com. All of these resources are managed by Elastic Beanstalk. When you terminate your environment, Elastic Beanstalk terminates all the resources that it contains. The Amazon S3 bucket that Elastic Beanstalk creates is shared between environments and is not deleted during environment termination. For more information, see Using Elastic Beanstalk with Amazon S3. Install Rails and its dependencies with the gem command. Use rails new with the name of the application to create a new Rails project. Rails creates a directory with the name specified, generates all of the files needed to run a sample project locally, and then runs bundler to install all of the dependencies (Gems) defined in the project's Gemfile. Test your Rails installation by running the default project locally. Open http://localhost:3000 in a web browser to see the default project in action. This page is only visible in development mode. Add some content to the front page of the application to support production deployment to Elastic Beanstalk. Use rails generate to create a controller, route, and view for your welcome page. This gives you all you need to access the page at /welcome_page/welcome. Before you publish the changes, however, change the content in the view and add a route to make this page appear at the top level of the site. Use a text editor to edit the content in app/views/welcome_page/welcome.html.erb. For this example, you'll use cat to simply overwrite the content of the existing file. This tells Rails to route requests to the root of the website to the welcome page controller's welcome method, which renders the content in the welcome view (welcome.html.erb). Use the Elastic Beanstalk console to configure Rails with environment properties. Set the SECRET_KEY_BASE environment property to a string of up to 256 alphanumeric characters. The secrets.yml file in the config folder of your project refers to this property. This property is used to create keys and should be a secret, as the name suggests. This is why you don't want it stored in source control where other people might see it. Set the SECRET_KEY_BASE environment property to any value. Under Environment properties, enter key-value pairs. Now you're ready to deploy the site to your environment. Create a source bundle containing the files created by Rails. The following command creates a source bundle named rails-default.zip. Upload the source bundle to Elastic Beanstalk to deploy Rails to your environment. Choose Choose File and use the dialog box to select the source bundle. When the deployment completes, choose the site URL to open your website in a new tab. When you finish working with Elastic Beanstalk, you can terminate your environment. Elastic Beanstalk terminates all AWS resources associated with your environment, such as Amazon EC2 instances, database instances, load balancers, security groups, and alarms. Choose Actions, and then choose Terminate Environment. In the Confirm Termination dialog box, type the environment name, and then choose Terminate. With Elastic Beanstalk, you can easily create a new environment for your application at any time. 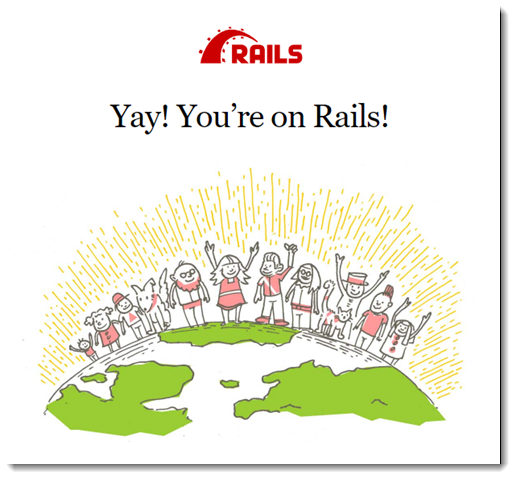 For more information about Rails, visit rubyonrails.org. As you continue to develop your application, you'll probably want a way to manage environments and deploy your application without manually creating a .zip file and uploading it to the Elastic Beanstalk console. The Elastic Beanstalk Command Line Interface (EB CLI) provides easy-to-use commands for creating, configuring, and deploying applications to Elastic Beanstalk environments from the command line. Finally, if you plan on using your application in a production environment, you will want to configure a custom domain name for your environment and enable HTTPS for secure connections.